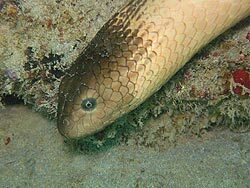 Sea snakes belong to the group of animals called Reptiles. They have specialized flattened, paddle-like tails for swimming and have valves over their nostrils which close underwater. As they breathe air using a large lung not gills, they are usually found in shallow water where they swim about the bottom. The lung, which can extends almost the entire length of the body, can also help with buoyancy to store air for dives. Most sea snakes can also take in oxygen through their skin. A special gland under their tongue concentrates and excretes excess salt water from their body. Their body is shaped like the keel of a boat. Many species have regular bands or rings of colour around the body. These are for camouflage, and perhaps to show that they are very poisonous or nasty tasting. They feed on fish, specially eels. Some even feed on fish eggs, molluscs and crustaceans (e.g. prawns). They have fine, sharp teeth to grip their prey before swallowing their prey whole, by sliding each jaw sideways while their skin stretches.Predators of sea snakes include sea eagles, sharks, large predatory fish, eels, and perhaps even crocodiles from below. All sea snakes discovered so far are venomous and produce some of the most dangerous venoms known in the animal kingdom but most species are considered to be non-aggressive. The scales on their underside of most aspecies (except the kraits) are smaller in size than land snakes an can be difficult to distinguish from the adjoining scales meaning they cannot move easily on land. Their scales usually do not overlap. Adults sea snakes grow to between 120 and 150 cm with the largest species growing to 3 metres. Sea snakes shed their skins much more frequently than land snakes; as often as every two weeks. This behaviour prevents the growth of barnacles and other animals on their skin. that grow on sea snakes. These organisms usually do not directly harm the animal; however the resulting drag can affect the snake’s swimming. By frequently knotting and shedding its skin, the snake is able to rid itself of these organisms. Sea snakes are active both day and night and often bask in the sunlight at the surface in the morning and late afternoon. If disturbed, they can dive to depths of over 90 m. They usually remain underwater for 20 to 30 minutes but can remain there for as long as a few hours. They are often seen in schools of several dozens. One species is classified as vulnerable, another is classified as endangered, and two species are classified as critically endangered according to the IUCN Red List of Threatened Species. 1. They have fixed front fangs and can open their mouths very wide to swallow prey items. The two popular beliefs are that they are rear fanged and have small mouths - neither of which is true. 2. Australian sea snakes do not come to land unless they are sick, injured or stranded. They do not bask like sea kraits do. If someone sees a sea snake up on the beach, they should notify a wildlife Authority about it and try to keep other people and pets away from the snake. They must never ever touch the head. Here I attach a sea snake stranding protocol. on the hand. Keep your hands to yourself. Filmed 1991 on various places of the Great barrier Reef, Australia. with the largest, Hydrophis spiralis, reaching a maximum of 3 m.
of the body. They can remain submerged for as much as a few hours.